Robinson Crusoe and his many, many animal friends. 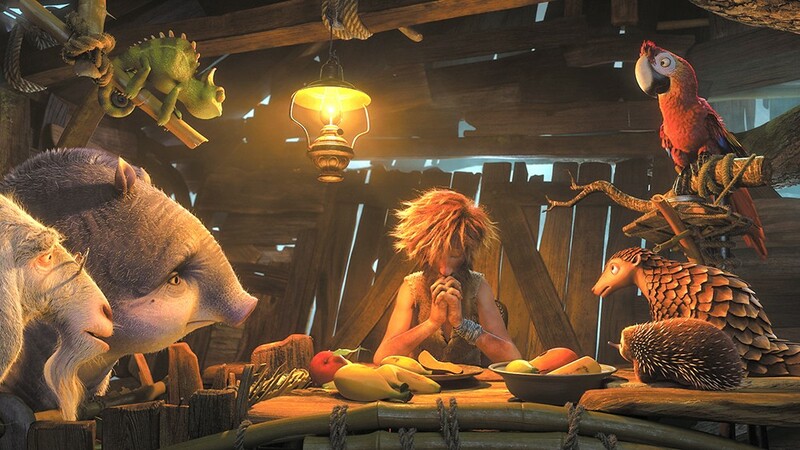 So, a movie for kids — strictly for kids; more on that in a moment — that has already been released all around the world under the title Robinson Crusoe is about to open in the U.S. as The Wild Life. Why the title change? Does Hollywood believe that Americans are too ignorant to recognize the name of one of the most classic of classic novels? Are Americans in fact too ignorant to recognize it? (I'm not sure which is worse.) It would be an exaggeration to say that this is even loosely based on the 1719 book by Daniel Defoe, but come on: maybe leaving the movie alone as Robinson Crusoe might have inspired a few children to pick up the novel later on (as perhaps it is doing elsewhere on the planet). The character's name is barely mentioned in the film, so the title was just about all the prodding the movie could give kids to check out a classic. Does our dumbed-down world really need to be dumbed down further? Possibly getting kids interested in literature is just about the only saving grace of this animated flick, apart from a general inoffensiveness as an electronic babysitter once it's available to watch at home. Under any title, it is suitable only for the smallest children still undiscriminating enough to be distracted by bright colors, trite slapstick shenanigans of talking cartoon animals and the sort of simplistic wordplay that presumes you've only just discovered idioms and the fact that words can have more than one meaning ("We'll make them pay," the feline villain cackles. "How much are we charging them?" her dim-bulb sidekick wonders). This isn't so much Crusoe's story as that of the animals on the small island upon which he is shipwrecked, including parrot Mak (the voice of David Howard), whom the human will later dub Tuesday (there is no manservant called Friday); pig Kiki (the voice of Lindsay Torrance), about whom many a joke about her being fat and eating so much will be flung; and others. All depictions of peril, such as the storm that stranded Crusoe, and all expressions of despair and loneliness, of which there are almost none anyway, come at purely toddler-appropriate levels, and the biggest moment of drama or surprise is when Crusoe comes to the conclusion that he had probably better build himself a shelter if he's going to survive. The Wild Life and The Wild Life 3D are not showing in any theaters in the area.